Chaur is a Punjabi word which refers to the tuft at the end a lion's tail when raised to wave high over its head, or a yak's tail waved as a fly whisk. The word chaur is related as much to the action of brushing, fanning, whisking, or waving high over head as to the object being whisked, waved, fanned, or brushed. In Sikhism, Chaur Sahib refers to a ceremonial whisk waved high over the Guru Granth Sahib, to reverently fan the scripture, by whoever is serving as an attendant. Chaur Sahib is a required article to be kept in the vicinity of where ever Guru Granth Sahib is installed. The chaur may be any size and is usually made of a yak's hair, or tail, that is fixed to a simple or decorative wooden, or metallic, handle. In the gurdwara worship place, any Sikh man, women, or child, may perform Chaur Sahib seva at any time while the scripture is open in prakash. In historic times, a chaur whisk would customarily have been used to fan royalty. A yak tail could also designate rank among members of the Mughal dynasty. Historically the Chaur Sahib would have been used by a sevadar attendant as a fan to cool the air and keep flies or other insects away from any of the ten gurus. 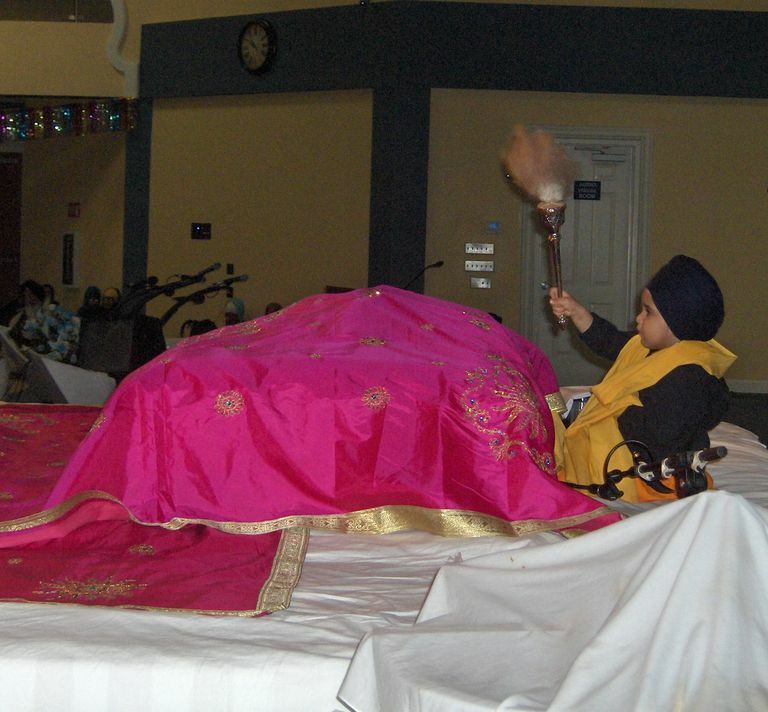 The same tradition of respect and seva is shown to the Guru Granth Sahib by Sikhs eager to express devotion. In Gurbani scripture, words denoting the action of waving or fanning have similar phonetic sounds, but have a variety Gurmukhi spellings. The term Chaur is phoneticaand may be transliterated in various ways using Roman characters, or English letters. Pronunciation: Chaur sounds similar to chore with the au vowel having the sound of aura. Also Known As: Chanwar, and in Gurbani, Chauri, Chavar, Chawar, Chamar, and Chour. According to scripture there is a long tradition of waving the fly whisk. In the ancient scriptures of Gurbani, there appear a variety of words with similar spellings meaning to brush, fan, wave, or whisk. Translations and transliterations are my own. What are the Five Required Daily Prayers of Sikhism?